With over 90% of the votes tallied in Israel’s election, Prime Minister Benjamin Netanyahu’s Likud party is in a dead heat with rival Benny Gantz’s Blue and White party. Prime Minister Benjamin Netanyahu has declared victory in national elections as exit polls show his Likud party gaining ground on its main rival. Exit polls put Likud and the rival Blue and White parties in a tight race. But recent projections appear to be giving Likud a slight lead and in a stronger position to form a majority coalition in the 120-seat parliament. He vowed to establish a right-wing nationalist government. Official results are expected later Wednesday. Two Israeli TV stations have changed their forecasts for final election results and are now projecting a narrow victory by Prime Minister Benjamin Netanyahu’s Likud party. Channels 12 and 13 are projecting Likud will capture 35 seats in the 120-seat parliament, compared to 34 for Benny Gantz’s centrist Blue and White party. Earlier, Channel 13 had projected the parties deadlocked at 36 seats apiece, while Channel 12 gave Gantz a solid 37-33 lead. Both stations early Wednesday also showed Likud and its religious-nationalist bloc of allies controlling a majority in the 120-seat parliament. Their updated projects mirrored partial results, which gave Likud a slight lead with about a quarter of votes counted. The leader of Israel’s Blue and White party has declared victory in parliamentary elections, despite mixed results in exit polls. A senior Palestinian official says that Israelis have voted to “maintain the status quo,” as exit polls revealed no clear winner in the general election. Both Prime Minister Netanyahu’s right-wing Likud party and the rival centrist Blue and White party claimed victory Tuesday. Both Prime Minister Netanyahu and the leaders of the rival Blue and White party, former military chief Benny Gantz and centrist politician Yair Lapid, have declared victory in Israel’s elections as murky exit-poll predictions rolled in. Both camps vowed they would call on allies to help them form a governing coalition. Israeli exit polls indicate Prime Minister Benjamin Netanyahu’s Likud and the rival Blue and White party are locked in a race that is too close to call. 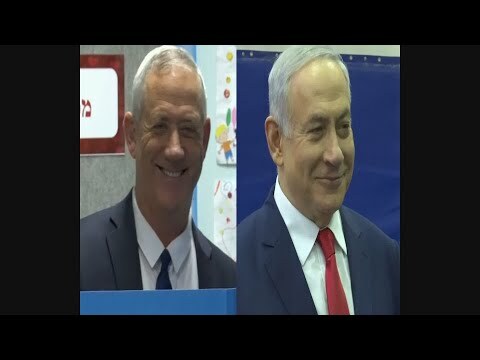 Channels 12 and Kan TV gave the Blue and White party, headed by former military chief Benny Gantz, a narrow lead over the Likud, while Channel 10 TV showed them in a tie in Tuesday’s vote. Arab leaders are making a last-minute push to implore their followers to vote in Israeli elections. Ayman Odeh, a leading Arab lawmaker, has been broadcasting on Facebook live, while religious leaders have been broadcasting calls on mosque loudspeakers. Many voters, accusing Prime Minister Benjamin Netanyahu of anti-Arab incitement, have decided to boycott this year’s vote. The decision could have negative repercussions. Arab parties could struggle to receive enough votes to enter parliament, potentially bolstering Netanyahu’s Likud party and its hardline allies. Arab political activists say the campaign has boosted turnout to 46% with under an hour to go. Israel’s central elections commission says overall turnout is over 61%. Israeli politicians are making the most of social media to campaign online until polls close at 10 p.m., with the main contenders taking to social media to appeal to citizens to vote as turnout flags. Prime Minister Benjamin Netanyahu filmed himself at the beach in Netanya on Tuesday and urged people to go vote or “wake up tomorrow to a leftist government.” Benny Gantz, a former army chief of staff who seeks to unseat Netanyahu, shared a video in which he appears to assist a motorcyclist who was involved in a traffic accident. Other politicians have urged Israelis to go vote, as voter turnout was lower than previous elections. The current election regulations in Israel bar television and radio campaigning on election day, but not social media. A prominent Israeli pollster says that Israel has never seen such a decline in Arab turnout, calling it “the biggest drama” facing the national election. Camil Fuchs told Israel’s Chanel 13 TV that exit polls revealed startling low turnout throughout the day. Prominent Arab politicians took to social media to demand their constituents push back against ballot boycott calls that put their parties at risk of dropping below the parliamentary threshold. Veteran lawmaker Ahmad Tibi called the low turnout “a real danger” to his party and the other Arab factions. Arab citizens, representing nearly 20% of Israel’s population, could help sway the vote. But many Arab citizens have pledged to boycott the election in protest of Netanyahu’s divisive campaign tactics and legislation declaring Israel the nation-state of the Jewish people. Palestinian President Mahmoud Abbas says “our hands remain extended in peace” on Israel’s Election Day. The election is largely seen as a referendum on Prime Minister Benjamin Netanyahu, who pandered to nationalist voters by vowing to annex the Israeli-occupied West Bank. But Abbas stressed that Palestinians would reject peace brokered by U.S. President Trump’s administration. Trump’s contentious policy changes, such as recognizing Israeli sovereignty over Jerusalem and the Golan Heights, have sidelined Palestinians, who seek Israeli-annexed east Jerusalem as their capital. Netanyahu’s challenger, Benny Gantz, has indicated he would not foreclose future peace negotiations. Israel’s elections committee has banned hidden cameras at polling stations following an Arab party’s complaints that it observed Prime Minister Benjamin Netanyahu’s Likud party deploying staffers who attempted to secretly surveil predominantly-Arab polling stations. Israeli media reported Tuesday that Likud dispatched 1,200 observers in Arab polls. The Israeli daily Haaretz published videos showing activists caught with cameras by police, with one confessing Likud had sent him. Police said they were working to “maintain public order” after “a number of suspected irregularities” in northern polls. Arab parties lambasted the cameras as a ploy to depress their constituents’ turnout. Israel’s election committee says midday voter turnout stands at 24.8% — or down 2 percentage points from the 2015 elections. But the statistic may not be a prediction of the overall turnout as polling stations close at 10 p.m. on Tuesday and many anticipate a last-minute surge of voters heading to the polling stations. Prime Minister Benjamin Netanyahu has delivered increasingly impassioned pleas to voters to come out and support him as the day wore on. He took to Facebook in a steady stream of videos to rile his national base by warning if supporters failed to vote, they’d wake up to a “leftist” government led by his chief challenger Benny Gantz. He says such a scenario is backed by a “secret deal” with Arab parties, which he often brands as his political foe. Netanyahu has become known for divisive campaign tactics, which critics call racial incitement. Popular centrist politician Yair Lapid has cast his ballot in Israel’s elections for his Blue and White party, appealing on Israeli citizens to vote. Lapid had joined forces with former army chief Benny Gantz to challenge Prime Minister Benjamin Netanyahu’s long rule. Lapid and Gantz, together with a slate of other ex-generals, formed the centrist Blue and White party in hopes of mobilizing opposition to Netanyahu, who faces serious corruption charges. Israel’s president and several other politicians have cast their ballots in the general election, offering messages to voters and urging for a good turnout. President Reuven Rivlin will have the task to choose — after the election — a party leader most likely to forge a governing coalition. Prime Minister Benjamin Netanyahu has cast his ballot in Israel’s general elections. Netanyahu is seeking a fifth term in office despite a cloud of looming corruption indictments against him. Another term would make him Israel’s longest-ever serving leader, surpassing founding father David Ben-Gurion. Benny Gantz, the main challenger to Prime Minister Benjamin Netanyahu in Israel’s general elections, has cast his ballot, calling for a “new dawn” for the country. Gantz voted early on Tuesday in his hometown of Rosh Haayin in central Israel alongside his wife, Revital. He called on all Israelis to get out and vote, saying they should “take responsibility” for their democracy. Gantz’s Blue and White party has inched ahead of Prime Minister Benjamin Netanyahu’s Likud in polls. Netanyahu still appears to have the best chance of forming a coalition, though, with a smattering of small nationalist parties backing him. Voting has begun in the Israeli elections as the country decides whether longtime Prime Minister Benjamin Netanyahu remains in power. Polling stations opened at 7 a.m. Tuesday with exit polls expected at the end of the voting day at 10 p.m. Official results are expected to come in overnight. Clouded by a series of looming corruption indictments, Netanyahu is seeking a fifth term in office. It would make him Israel’s longest-ever serving leader, surpassing founding father David Ben-Gurion.